I had been asked by ShelterBox to assess the need for help. On my initial visit 22 days after the F-4 tornado struck, I actually missed the turn into the housing area as my attention was drawn to a mobile home standing in perfect condition, except for the completely absent roof. We learned from talking with volunteers that an additional (approximately) 25 families would be returning to the site to stay. People were sleeping on the ground, some on cots, some on bare ground, some under tarps, and some just out in the open. It was 100 degrees on the day of my first visit. The water supply for the entire community had been destroyed along with everything else. It was hard to comprehend we were looking at a community right here at home, in the good old USA. We advised ShelterBox there was a need for tents. Two hundred tents were sent into Oklahoma. Two Rotarian ShelterBox Response Team members were sent to instruct teams on how to install and erect the tents. As this was my first ShelterBox assessment, I will never forget the families who came to me personally and thanked me for the tents that provided a safe, dry environment for their families. The disaster continues as insurance money runs out for families who have nowhere to go but back to their land. The tents are a lifesaver for them. We had magnetic signs on the car to identify ourselves as ShelterBox representatives. During one stop, my wife (also a Rotarian) remained in the car while I went inside for paperwork. A young man, tears running down his cheeks, knocked on her car window and asked if we could help him. He had a wife and two small children who had spent last night in their car. Housing allowance on their insurance had exhausted; so they had no choice but to live in their car. He had seen tents and prayed he’d get one for his family. We were happy to provide one and they were so thankful to have their need for basic housing met. Rotarians from local clubs provided many hours of labor, support, and transportation of tents. Work continues in assessing community needs and transporting and erecting the tents. This experience has brought home to me that Rotary really is about “Service Above Self.” I’ve been doing ShelterBox presentations since 2005 and this personal, hands-on experience will certainly enhance my future presentations. To date, approximately 70 families in Oklahoma have received tents and this number continues to increase. 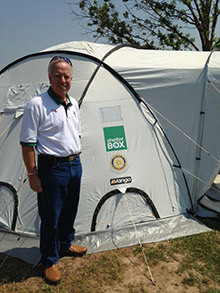 Editor’s note: ShelterBox is a project partner of Rotary. David Shirley gives presentations to local Rotary clubs and other groups to help raise awareness and funds in support of ShelterBox’s relief work. As a local volunteer and Rotarian, he assisted the ShelterBox Response Team that deployed to Oklahoma to identify the most vulnerable families. Read a blog post from a Rotarian in Moore, Oklahoma, and discover how Rotary is taking action to benefit communities like Moore. This entry was posted in Disaster recovery and tagged Disaster recovery, ShelterBox by Rotary International. Bookmark the permalink. Shelter Box is a wonderful program. I’m so happy that rotary is part of this.